Sanding and staining wood floors or furniture might sound like an easy prospect, but you risk developing a sticky finish. This can occur when the stain isn't properly applied or if dust and other debris adhere to the surface. Even high levels of humidity in the surrounding area cause stickiness, as the moisture in the air keeps the stain from properly drying. Regardless of the reason, you can fix the problem by re-staining the wood. Brush on a thick and even coating of the gel-based paint stripper. Work in small, manageable areas at a time, applying a coating to the surface of the wood. Once the paint stripper permeates the wood stain, scrape off the old stain with the paint scraper. Rub every piece of the wood with a dry rag, removing any paint dust. 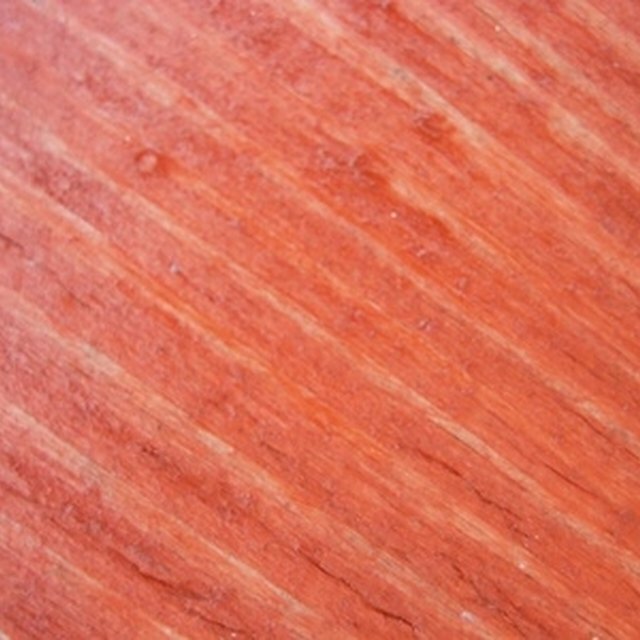 Sand the surface of the wood with coarse-grit sandpaper, like 100-grit sandpaper. Use the abrasive side of the paper to remove any bits of stain left on the wood. Go back over the piece with 200-grit sandpaper, smoothing out any rough spots on the wood and any imperfections. Wipe the wood down with the dry rag, brushing off wood dust. Shake the wood stain slightly before opening it, giving the ingredients a chance to mix together. Place the paintbrush in the wood stain and wipe off any excess stain on the side of the canister. Lightly brush the stain on the wood and then rub a rag across the top. Keep applying more wood stain to the wood, until it's the right color. Apply a coat of sanding sealer to the wood, using the paintbrush. This clear coat seals the stain into the wood. Follow the natural grain of the wood, moving the brush quickly and evenly along the wood. Cover all areas of the wood and then let the sealer dry. Rub the 200-grit sandpaper over the wood lightly, just buffing the sanding sealer. Wipe the wood down with a dry rag, removing any additional dust or debris that may become trapped on the surface. Finish with a coat of clear sealant applied with a paintbrush, to seal and protect the wood. Work in a well-ventilated room or outside to reduce the affects of the chemical fumes.